The South Central Ohio Educational Service Center’s (SCOESC) Gifted Services Department revealed its annual review this week, showcasing nearly a dozen major programs that it has hosted in the past year, which grabbed the attention of young students and invoked interested in their education through unique, hands-on opportunities. The review also touched base on some of the upcoming programs that the ESC is working on for the next academic school year, from mentorship activities to a new artist-in-residency at Northwest High School, which will create a new permanent installation in the SOMC Life Center. The highlights from 2014-2015 varied in themes of educational accomplishment and touching artistic experiences. The mentorship program was highlighted for providing students with opportunities to meet professionals in particular fields. Through the program, the mentors and students meet and students are able to talk, learn, and receive guidance, as they consider the field of study they will soon enter. Junior and senior students are eligible to receive a mentor and can be recommended by their school’s guidance counselor. The ESC also claimed that they are looking for more mentors. Interested parties can contact Sharee Price. Many students received summer scholarships to continue their education throughout the summer months, but in a camp or like setting that focuses on a field of their personal interest. The program collects donations from sponsors in the community and then awards the scholarships to provide students with added educational means, from music and art to science and engineering. The organization also operates various academic competitions, Scioto County Mock Trial, Scioto County Quiz Bowl, and the Scioto County Science Fair. The review revealed many photos of and experiences by students who competed with others over science, logic and more in these academic environments. These competitions offer opportunities for those students who don’t often get to shine though their academic achievements in a school setting. The review also highlighted artistic academic achievement, such as music scholarships and the celebration of the 73rd Annual Scioto County Honors Musical Festival. Students in various high school bands and choirs all over the county meet each other on the field and in competitions all of the time, but rarely get to work together on creating something positive. The ESC has worked hard to get all of the Scioto County talent together to perform challenging and beautiful pieces. The 2015 festival featured the talent of 151 members, as well as local band and choir directors from all over the county. The students talented in visual arts were also highlighted through two different exhibitions that were held, the Visually Literate High School Art Show, which is held in the Southern Ohio Museum and Cultural Center, and the Youth Art Month Exhibit, “Youthful Visions,” which was on display at the Local History Department. Finally, the review put the spotlight on the beautiful impact art can have on a person. 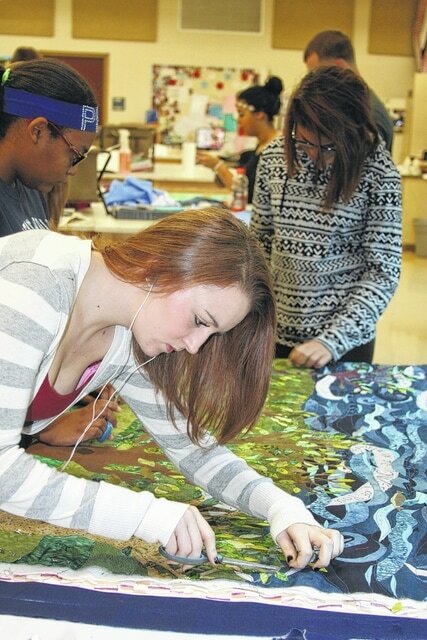 Students from Portsmouth High School worked with the Artist-In-Residence Program this year. These students spoke with and listened to stories told by local cancer survivors. They then used these words of hope and love to make a piece of fabric art that told the stories of the survivors. The piece was put on permanent display in the Southern Ohio Medical Center’s Cancer Center and the students presented it to those survivors who caused the students to make it. Another deep impact was caused through sketching done by students all over the county. The project is known as the Memory Project and involved many skilled local students who sketched detailed pieces of art from photographs of orphans across seas. These orphans don’t often receive gifts like the ones the students made and they usually become special keepsakes that are cherished forever. Local students created 24 portraits this year. The work completed by many directors, teachers, and donors impact not only Scioto County children, but people all over the world. Much of what is accomplished is done through grants, but a majority also comes from local support. Director Sharee Price said that she welcomes any local individual or business to assist them in making the dreams of local children a reality. Price went on to say that the local ESC reaches students in every local school and that each and every student is important to the future and direction of the community.